Water is one of the most important things that we put in or on our body. Interestingly enough, it’s also commonly one of the things many of us don’t get enough of or ignore altogether. Our bodies are primarily made up of water (about 60%) and we need to replenish the water that will be lost throughout the day due to daily living. Health professionals tend to recommend about 8 glasses a day. That sounds like a lot to drink and for some of you it probably feels impossible! However, with a few of the right tips, you’ll be getting your 8 glasses each day with little to no additional effort on your part! Naturally, these 10 tips aren’t going to work for everyone, but try out the ones that you think will work for you. The worst that can happen is that you end up drinking more water. This may sound harsh to some, but if you think about it, it makes some sense. If it’s caffeine you’re worried about, tea still has it. It’s also essentially flavored water when you consider how it’s made and what it is made of. You can opt for iced tea or hot tea. Either way it’s going to add some more water into your system. There are hundreds of teas on the market, so it’s highly likely that everyone can find one kind that they enjoy. Trying to lose weight? Consider drinking Green Tea. Green tea has less caffeine, but it’s loaded with antioxidants and has been known to help people lose weight. If tea isn’t for you, consider adding fruit to your water instead. There are thousands of different infused water recipes floating around on the web. You don’t even need a recipe really unless you’re looking for ideas. You just chop up the fruit, vegetables, or herbs you like and add them to a pitcher of water. Place the water in your refrigerator to get cold and it will be waiting for you when you’re ready for it. Some ideas you could use include strawberries or blackberries, oranges, lemons or limes, or even cucumber. You might think you’re getting plenty of water. Then again, you might be wrong. If you don’t keep track, but want to make sure you’re getting enough water one way to do it is with a water consumption app. While there are a variety of apps available and some vary based on the phone or tablet you use, the goal is the same. Most allow you to just tap to log that you’re drinking a glass of water. It then keeps track throughout the day, so you know how much you’re drinking. One popular option for iPhone users is Waterlogged. One of the easiest and most environmentally friendly ways to get your water intake is straight from the tap. However, many people are worried about contaminants or they find their water tastes funny in comparison to bottled water that has no taste. A good water filter can remove both of these issues. Water filters will remove a lot of the contaminants from your water and should make it taste great. Best of all, there are filters of all kinds that suit every budget. You can get convenient reusable water bottles that have filters in them. If you’re looking for an inexpensive option to enjoy clean drinking water in your home you can also opt for a faucet water filter, which is cheaper than a whole house filter and allows you to choose the faucet that has the filtered water. 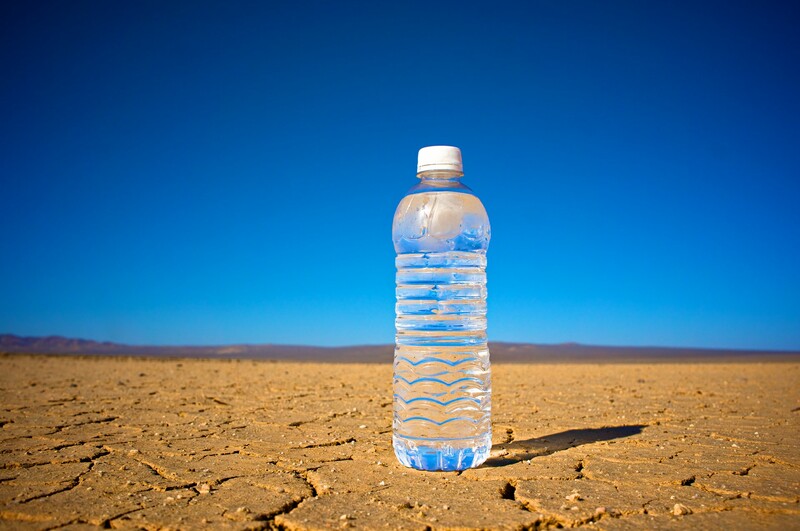 Speaking of bottled water, one great way to get more water is to always carry a bottle with you. You can find plenty of great reusable bottles, and some even have filter spots for fruit, ice, or whatever you add to your water. Just fill up your bottle and go. This gives you plenty of chances to up your water intake and since the bottle is reusable, it’s easy to refill it whenever you need to. By connecting water with some of your most basic activities you’ll be sure to drink more than enough, and you’ll get used to it being part of your routine. So, next time you get up for a snack or to go to the bathroom, grab a bottle of water or drink a glass right there. You should never miss a chance to refill your bottle of water when you’re out and you should make sure to find the time when at home to add more water into your routine. If you go out to eat or you go to a bar, always make sure that you order a water wherever you go. When you get your drinks use the 1-to-1 rule. This rule ensures that for every soda or drink you have, you also have a glass of water. If you’re drinking alcohol, this rule is also helpful in avoiding hangovers. You can also get water into your system when you eat foods that have a high water content. There are plenty of fruits and vegetables that offer high water percentages. Snacking on these will not only be better for you than many alternatives, they will also add some water into your system. Some top options include cucumbers, which are 96% water and watermelon which is 92% water. Other good picks include zucchini (95%), grapefruit (91%), lettuce (96%), celery (95%), and tomatoes (95%). These days it’s hard to find someone who can live without a cell phone. Most people have their entire lives on their phone, especially when it comes to their daily schedule. With that in mind, set some reminders to drink your daily water. Pick a few times throughout the day and your phone will ping you when it’s time to pick up a glass of water. This tip is especially helpful to those who want to eat less or lose some weight. Drinking a glass of water before you eat is going to create a feeling of fullness. You’ll still be able to enjoy your meal, but you won’t eat too much, and you’ll be adding more water to your diet. It’s a win in more ways than one! By utilizing some of these tips, you’ll be well on your way to getting the required daily amount of water that your body needs!